The weeks continue to pass us by and thus bring more news, including the confirmation of the DB11 Volante roadster, the Mercedes-AMG GT and GT C Roadsters, and our first look at how the new Mercedes GLB might look. 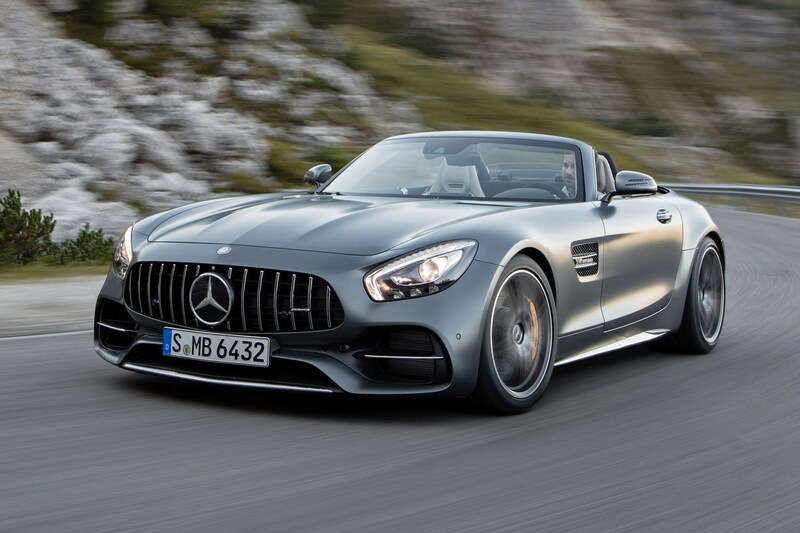 The AMG GT lineup is officially expanding as Mercedes have revealed the GT and GT C Roadsters. Both of the new Mercedes-AMG GT models have been unveiled ahead of their official debuts at the Paris Motor Show in a few weeks, with the entry-level model being the 469 bhp GT Roadster and the more powerful option being the 549 bhp GT C Roadster. Both are powered by a 4.0-litre twin-turbo V8 engine with a seven-speed dual-clutch automatic gearbox to go with it. Whilst the cars may look like they've simply had their roofs swapped for soft-top equivalents, there's also been the inclusion of some cool chassis technology out of the the GT R, making the cars more thrilling and enjoyable than ever. Prices are yet to be revealed for either models, but it is estimated that the GT Roadster will cost roughly £100,000, whilst the GT C Roadster will set you back around £120,000. A new convertible version of Aston Martin DB11 Volante is officially on the way. Aston Martin have teased the world with these photos of the DB11 Volante but at the same time not given much away. The car definitely shares the same look and shape as the DB11 Coupe with the same lines, curves, lights and vents all evident to see. However there are some odd panels on the bodywork that suggest it may look slightly different in places. Under the hood you can expect the same 5.2-litre twin-turbo V12 as in the DB11 Coupe, meaning 600 bhp, 0-62 mph in 4.3 seconds and a top speed of around 200 mph will all be available at your foot. The release date wasn't confirmed alongside the teaser but the 'Opening Spring 2018' decal on the side of the car suggests that it may be spring 2018, however we'll be sure to let you know when it's officially confirmed. The iconic G-Wagen is set to have a smaller sibling in the shape of the new Mercedes GLB. Whilst the GLB will sit between the GLA and GLC models, it won't actually act as an in-the-middle option for the two. Instead it will look to be a smaller, cheaper equivalent of the G-Class, acting as a more affordable option than its near-£90,000 older brother. No images have been revealed as of yet, but the clever folks at AutoExpress have managed to produce a render of how it could look. Notice that it still shares the same boxy shape as the G-Wagen, but instead receives all the new design touches that are synonymous with all new Mercedes models, including the chunky flat front grille, smooth curved body shape and sparingly used lines. It's unknown as to when the GLB will be announced or available to buy, but we'd guess that some time late next year may bring its reveal. The facelifted Volkswagen Golf R estate has been spied out and about undergoing testing. Whilst Volkswagen only launched the Golf R estate last year, it looks as though the facelift will be arriving pretty soon after it was spotted being tested on the road. Although you'd say it's quite unnecessary to facelift the estate so soon, the Golf R hatchback has actually been available since 2014, so a facelift for both was likely to be launched around the same time. It's hard to see any significant changes from these shots, however you can see that the front bumper has a larger air intake than the current model, and the rear is perhaps a bit sharper. You'd imagine the interior will probably get a few updates too, and perhaps even a small power increase to around 320 bhp. More details are likely to emerge over the next few months as the car looks towards the end of the year for its launch. Renault's design boss has confirmed that the new Clio will have an extra-special interior. According to Renault's head of design, Laurens van den Acker, the next-generation Clio will take a huge leap forward inside the car due to the lack of wow factor the current model suffers from. Van Den Acker said "Our customers look at the exterior and go 'woah', but then they look at the interior and go 'Huh?'" before saying "we are pushing a revolution." Whilst the current interior isn't exactly dreadful, it is significantly lacking. The steering wheel is horrid, the seats are tacky, and the materials used throughout the car just seem cheap and low quality. That's set to be addressed however, with better materials, next-generation tech and a revamped look and feel all due to arrive. The new Clio is predicted to launch in 2018, so we'll see then whether they deliver on this promise!